Coconut oil and all you need to know about it. It plays a big role in conditioning of skin as well as hair and nails. It contains plenty of valuable properties and its action amaze millions of women around the World. It consists of vitamins, minerals and fats. Obviously, it must be coconut oil we talk about. You can use coconut oil any way you want to and however you want to. You still don’t believe us? Mix a table spoon of coconut oil with a table spoon of sugar in a bowl. This way you will obtain body peeling, great for exfoliation of dead skin cells, nourishment and smoother. If you deal with dry and dehydrated skin, then coconut oil will be great for it too. Use it after every bath or shower as a moisturising balm. The cosmetic can help you greatly also as a natural specific for irritations and speed up healing of minor wounds. Coconut oil in a perfect way works as a make-up remover and can easily deal even with waterproof cosmetics. Hair, just like skin of body and face, need a proper care. Here can also help coconut oil. You can use it as a regenerative hair mask to moisture and nourish damaged streaks and scalp. What is more, it helps with dandruff and cures skin inflammations. If you mix coconut oil with baking soda, you will obtain natural toothpaste. The preparation protects oral cavity against infections and diseases. 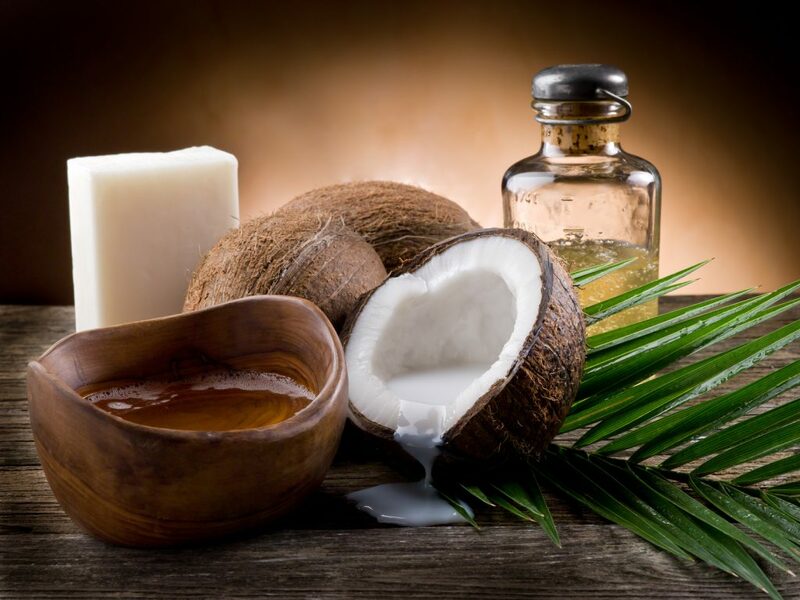 Did you know that coconut oil can be ingested as a part of the slimming diets? The product does not contain cholesterol, accelerates calorie burn and on top of that is tasty. It will protect you against hypertension, diabetes and diseases of the cardio-vascular system. Coconut oil is an ingredient of many cosmetics. You will find it in the products from Nacomi. You will learn that as an addition to peelings, body balms and hair masks it is a true revelation. Furthermore, coconut oil is also present in products from Pamler’s. Hence, it is an ingredient of shampoos, hair masks, hand creams and face creams.